Considering Z’s personality it got me to thinking that perhaps I would want to separate out the geldings from mares. This plan has two separate pastures as well as a third smaller one for ponies or horses that need drylotting. The plan is NOT to scale… Click the diagram and it opens to a larger format. Pasture#1 and the drylot paddock would be on poorer grazing land specifically for the use of easy keepers, ponies, laminitic-prone and/or Insulin Resistant horses. Pasture #1 shelters are 4 stalls in the L-shaped shedrow barn. This pasture opens to the drylot and to pasture #2 so all horses can be together if desired OR horses could be easily rotated from one side of the property to the other. Gates should be wide enough for tractor passsage. The drylot is a skinny strip between pasture #1 and #2 to separate horses in #1 and #2 that may behave badly over the fence. It could be used as a recovery paddock also. 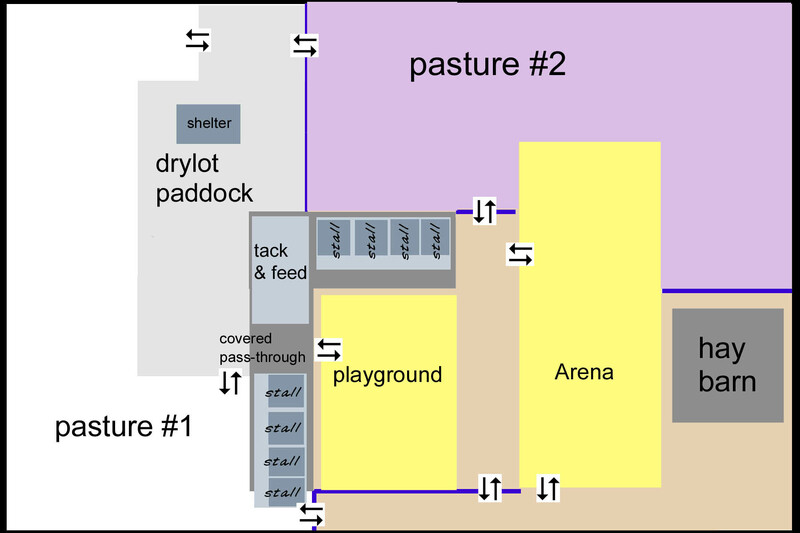 Access is through a covered aisle between the pasture #1 stalls and the tack/feed room. A small pony shelter or a loafing shed is in the paddock. Pasture #2 is planned for open field grazing for hard keepers, higher metabolism horses or those who need more grass because of their amount of work. It also has four stalls for shelter. It would also be possible to use pasture #2 as mowing field instead. A small arena which can be used for training, groundwork, or some limited riding (i.e. beginner lessons) is located inset into the shedrow barn. The larger arena can be dressage, jumping etc… Access to these arenas is placed for entry from the barn or from the front of the property. Hay barn is accessed by road from the front of the property. Delivery would not involve opening gates and possibly letting horses out. There is also a fence across the front of the “playground” to prevent horse escapes from the barn area. This plan, like the others (see the Category: Dream Home/Farm) are all designed to be built in stages. For example, one side of the L-shape could be built with one pasture and the stalls are first an open loafing shed that is later divided. Building stages lets the owner do it s money comes available, though I recommend that all electric and plumbing be put in at one time (even for future areas) as this does save money. This entry was posted in Barn Design. Bookmark the permalink.